Last week I wrote about making a Ruby and Rails course, and some of the lessons I learned in the process. One of the biggest lessons that I learned was that Ruby and Rails is way too much for a single session. Part of that pain came from the Rails cheat sheet created for the course because it was missing a lot of key information about Rails. We liked the idea of limiting the sheet to a single page, but lacking focus on a single topic resulted in a few frequently asked questions during the class that indicated that the cheat sheet wasn’t quite right. To start the process of improving my course materials, I have updated the Rails cheat sheet based on feedback and experiences from the class. This version is entirely dedicated to information about Rails, which allowed for a few additions that I think are pretty valuable for any developer getting started with Rails. The core concept in any framework is the architectural pattern it uses. This section is to help remind people what each part of Rails’ MVC pattern is used for and remind them of the naming conventions used. I found that I often confused which objects were singular or plural when I started with Rails and wish I had this kind of reminder when I was just getting started with Rails. 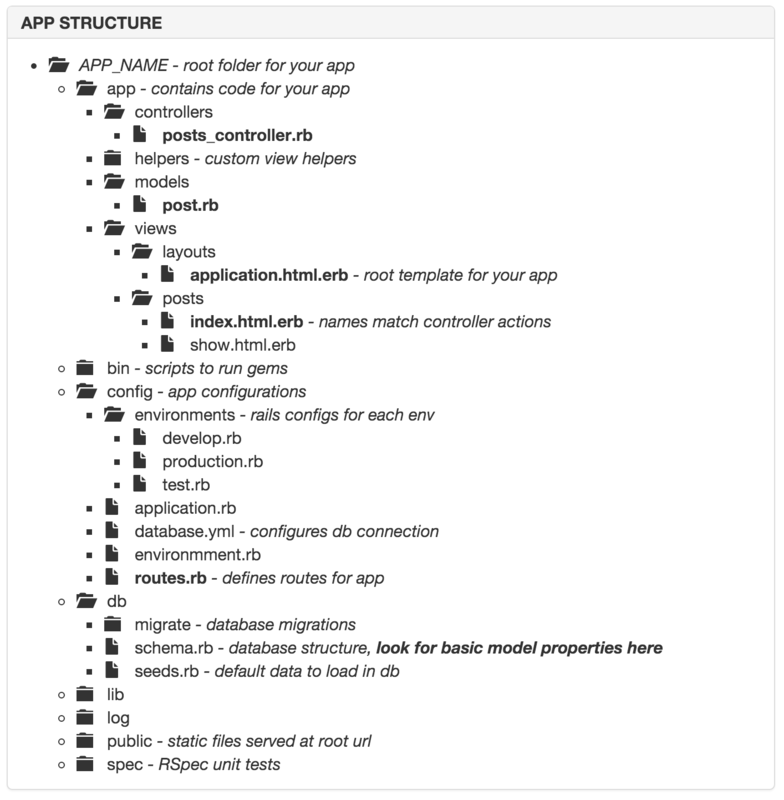 One of the more complicated things that you need to understand when building a Rails app is the application structure, or where all the different files go. There are tons of files and folders in a newly generated Rails app, and I definitely found it intimidating as a beginner. I have seen cheat sheets that show the file structure before, but I tried to make what I needed when I was starting out in Rails by adding comments next to folders and files to help explain what the important files are. The last big change to the cheat sheet was adding common patterns that you find in almost every Rails controller. The method names seem to be intuitive now that I am an experienced Rails developer, but when I was new it could get a little confusing if I had to write the code myself. To help others with this problem, I came up with a short list of query methods that I see most frequently in simple applications. 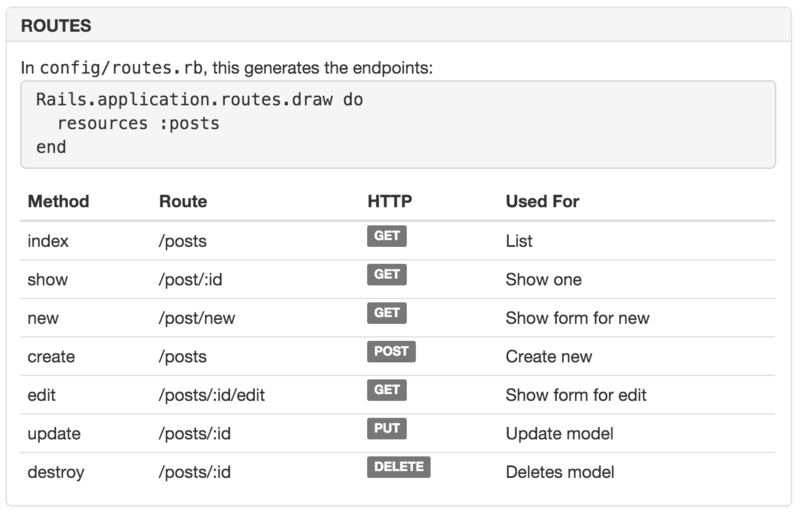 When I was starting out with Rails, I think the hardest thing for me to remember was how basic routing worked. I understood what CRUD actions were, but remembering the exact name for things is something I always struggle with. To help with this, I’ve shortened down the table in the Rails guide that explains this concept into something that fits on the cheat sheet. I had this in the original, but was able to add the HTTP verbs by condensing the wording. I’ve started to find that there are a lot of different commands that you need to know to be able to function in a Rails development environment. I got a lot of tips and tricks from my coworkers when I started that made my day-to-day tasks significantly easier. I included the basics and these tips in this section to pass on this knowledge to others. I’ve really enjoyed trying to make a cheat sheet for something I use every day. Hopefully others are able to find this work useful. If you have any comments or suggestions, let me know! I hope to make more cheat sheets soon. Rather have the cheat sheet in a different format? You can find it as a single web page here, or download a PDF version here.